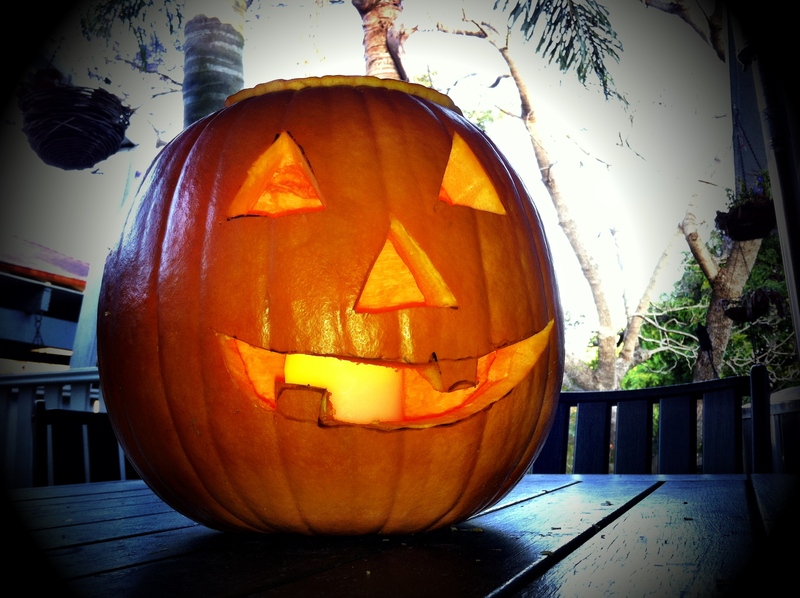 Ultimately, this post is about a pumpkin. 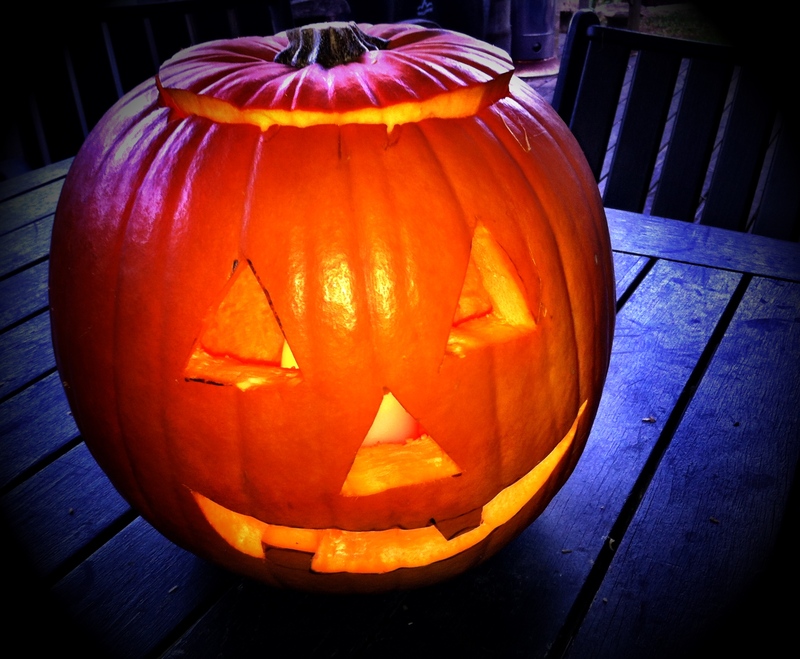 Not a pumpkin that we have eaten, but I figure that since pumpkin is actually edible, this post belongs on a food blog! Coming to Australia as a child, there were so many things I missed about America. Halloween was a big one. 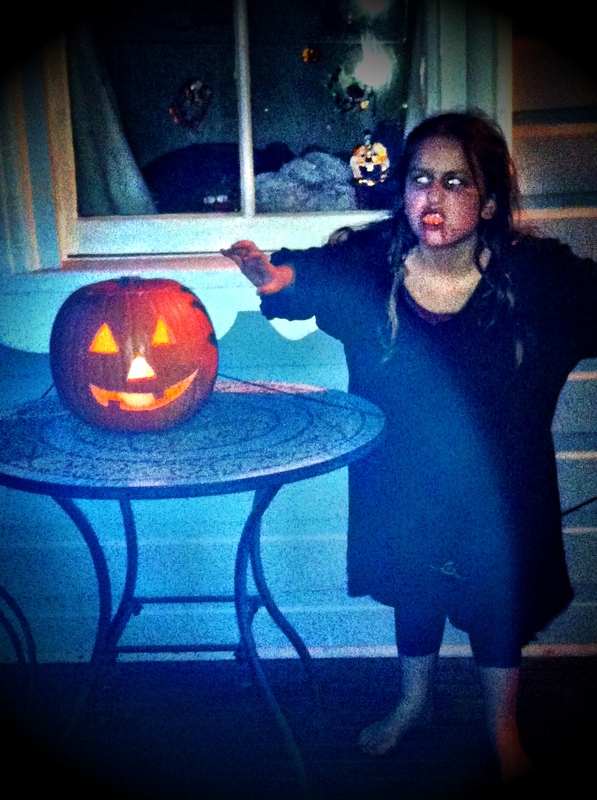 What child couldn’t love Halloween? Getting dressed up in costumes, decorating everything in sight, cutting up and lighting the pumpkins, and … candy candy candy! Heaven! But back then, NO ONE celebrated Halloween here. Everyone knew what it was but it hadn’t caught on. The chocolate and candy here weren’t the same or as varied. There was no candy corn, a personal childhood favourite, no Hershey’s, and even M&Ms hadn’t come here by then. And the only pumpkins were big funny shaped blue pumpkins. They taste good but just didn’t appeal for carving. The one saving grace was that for the first 4 or 5 years, my grandmother used to post us a big box of American munchies. Bless her! Halloween still isn’t huge here, but it is getting bigger every year. Nowadays you do see houses decorated and kids do go out trick or treating, especially in our little pocket of the world for some reason. For the first time since I can remember, the local shops were selling American pumpkins!! We won’t talk about the OUTRAGEOUS price being charged, but these were proper big round bright orange easy to cut American pumpkins and when my daughter saw them she HAD to have one! The kids had so much fun (with some help from Wal) gutting the big fella and carving a face into him. And, today, the kids were allowed to go to school in costumes – lots of fun for kids who are used to wearing school uniforms! Of course this is the Sunburnt Country, and while we are a long way from the summer heat, Halloween is different in the heat. Think sweat-streaked makeup, sticky wet costumes, and of course the chocolate (and the pumpkin while off duty) requiring refridgeration! I am always amazed at the volume of food that is consumed when I have people over. Especially when there are kids involved. It’s not a bad thing – I would feel inadequate if the entire mountain of food I presented wasn’t enthusiastically devoured, but … it does pay to have some fillers in there to start things off. Dips are a great option. They go in and out of fashion, but the reality is, people love them, and the flavour and ingredient combinations are endless. This is one of those recipes that is more successful with kids if you don’t tell them what’s in it. I’m not sure why, but the poor old pea maintains its dreary reputation although I am sure none of the kids I know have been subjected to the over-boiled mushy nightmares of generations gone by. 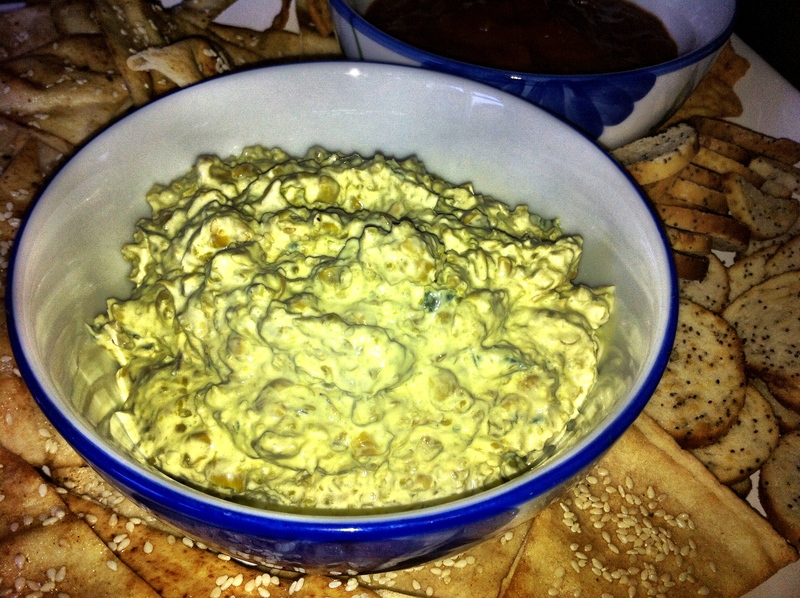 This dip is lovely and fresh and is good with vegetables or crackers. I have served this one with crackers made from lavash and lebanese flat bread. Mix oil with cumin and paprika. Brush over the bread. Cut bread into cracker sized pieces. Sprinkle with salt and sesame seeds. Place on tray in oven and cook until crisp (approx 5 minutes). Be careful not to overlap the crackers on the tray, and keep an eye on them because they burn fast! Cracker recipe courtesy of my friend Antoinette! I was so surprised (not!) 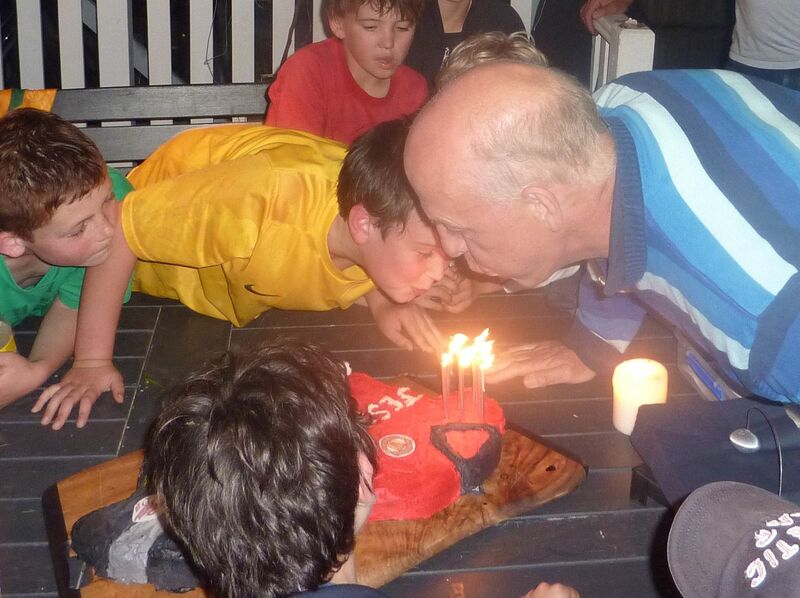 when my beloved son told me he wanted to have a soccer party followed by a BBQ at home to celebrate his birthday. I love the fact that he requested a BBQ so that the families of his friends could come too – so that his party would be fun for everybody. And the fact that he shares a birthday with his wonderful soccer coach sealed the deal. Of course this means having enormous amounts of food! – but everyone is generous and helps out on that front, leaving me to do the odd dip, a couple of salads, a mountain of kebabs, and of course CAKE. The rest of the plan sounds easy – take the boys to a park and let them run themselves into the ground before you bring them home for a feed and more playing. Of course the reality is, there is no such thing as running a bunch of 10 year old-ish boys into the ground. Five minutes of chill out time and they are full of beans again. Anyway, I was immersed in kitchen activity when the boys made their noisy appearance at the house. Suddenly a couple of mums screamed “out out OUT!!!”. I looked up to see that the boys had had a water fight to cool down after the game, and so they arrived at the house sweaty, stinky, ravenous AND covered in mud! Yay – go the dads who were so thoughtfully supervising park activity! It is a true testament of our friendships that we could move on with the day. Of course the boys played on in the backyard in happy oblivion. 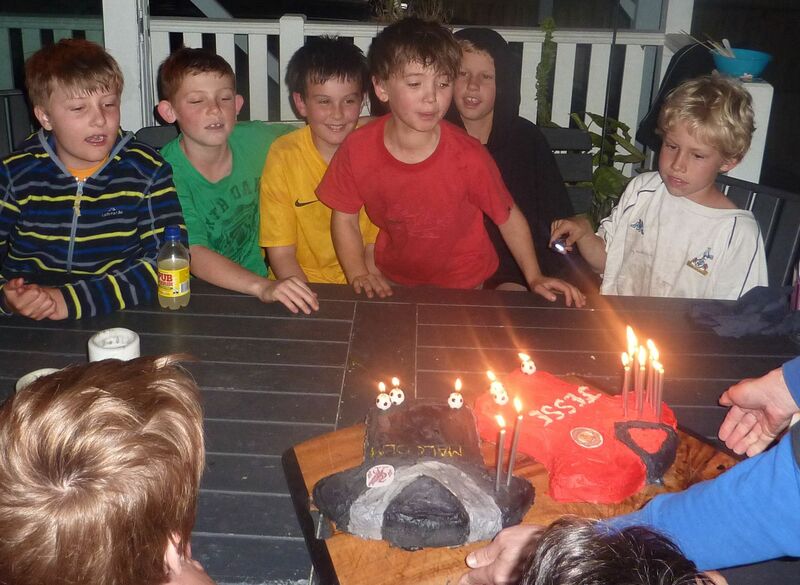 Eventually, after large quantities of food were consumed, the garden was slightly trashed (the backyard had a bit of a Lord of the Flies vibe going on there for a while), and some sporadic quiet was acheived due to a live soccer match on TV featuring the Sydney Football Club, it was time for the cake. 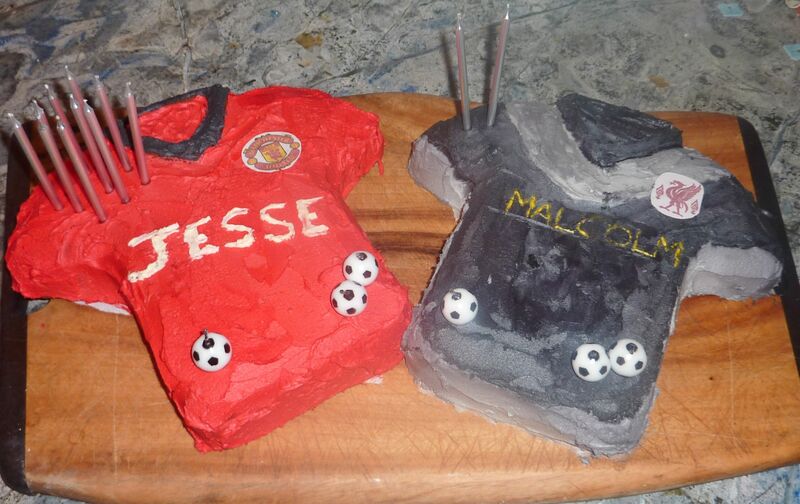 In keeping with the party’s theme we had two cakes – in the shape of soccer jerseys and decorated in the colours of the birthday boys’ favourite teams. I took the easy route and used shaped cake tin, rather than cutting them to shape. The cake recipe that I use is my standard for all cakes I make in moulds. It takes the mould well, and is solid enough to withstand a bit of prodding in the icing process, and it has a lovely buttery vanilla flavour. Preheat oven to 180C. Grease cake mould. This recipe will make the equivalent of two 18cm round springform pans. Beat butter and sugar until pale and creamy. Beat in eggs 1 at a time until well combined. Add vanilla and milk and beat in. Fold in sifted flour and spoon batter into tin. Spread with a spatula to make sure batter reaches all crevices. Cook for 40 minutes or until a skewer inserted into the middle comes out clean. Once cooled to room temperature, place cake in fridge or freezer to firm up before icing. Rocket is my favourite salad green. So many things taste good with rocket. I add it to green salads that might otherwise be bland, and it is a great topping for a range of foods from risotto to casseroles to soups. 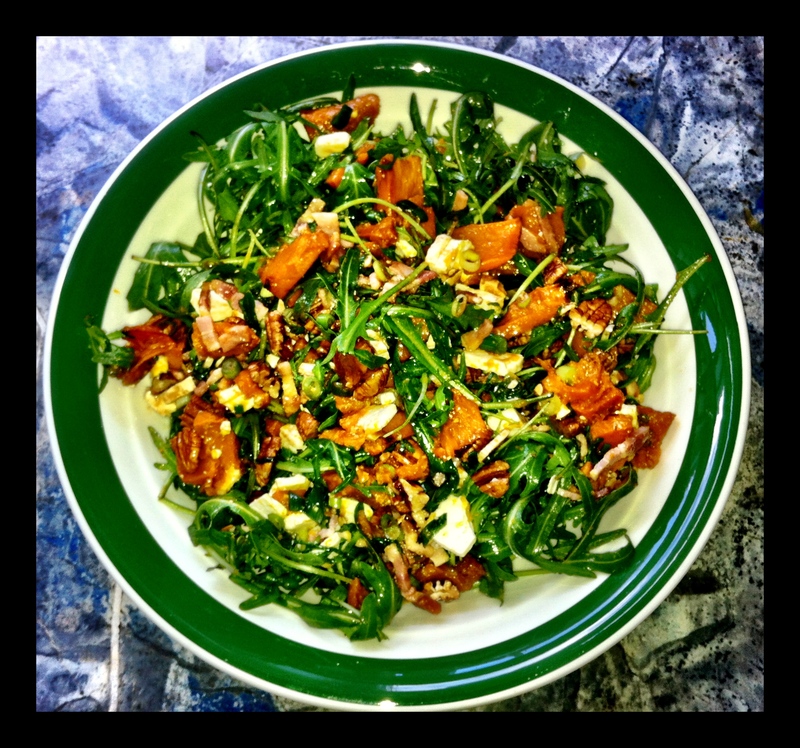 Rocket is also fabulous as the basis for a salad with nuts, seeds, and an assortment of vegetables. A salad like the one below works as a main meal for lunch, or as an excellent accompaniment for a simple barbecue. Cut pumpkin into 1.5 cm squares. Place on oven tray with garlic and 2 T macadamia oil. Roast until soft. Set aside to cool. Wash and drain rocket and place in a shallow salad bowl. Add pecans and onion to salad bowl. Crumble feta into salad. Add pumpkin and mix salad carefully. Drizzle with vinegar and remaining oil, and season. The Sydney International Food Festival runs throughout October and there are special foodie experiences to be enjoyed throughout the city. The program includes everything from fine dining meal specials at top restaurants with international guest chefs to night noodle markets and breakfast at Bondi Beach. Whether you are a visitor from out of town enjoying the sights or a local getting out and about, the festival is a fun way to see and enjoy Sydney. And Sydney is at its Harbour sparkling best in spring. 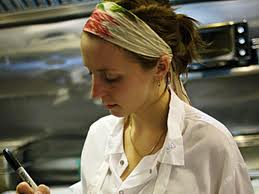 One of the Festival’s special guests this year is Christina Tosi from Momofuku Milk Bar in New York. I went to see her talk about Milk Bar at one of the World Chef Showcase sessions. The baker in me was so inspired and excited to see her. It was amazing to hear someone proudly proclaim their love of sugar, and laugh about often preferring doughs and batters to the finished products. The great inspiration was the story of someone who has been able to turn her philosophy of having fun and not taking herself too seriously, along with a serious sweet tooth, into a successful business. This ‘fun philosophy’ (along with a nod to American food traditions) is the starting point of her recipe ideas and the heart of the success of Milk Bar. 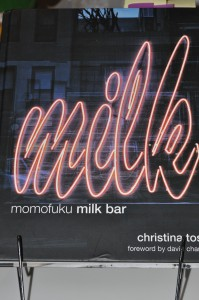 Christina Tosi is particularly known for her cereal milk, compost cookies and crack pie, all of which are featured in her new cookbook: Momofuku Milk Bar. We tasted a compost cookie during the session and it was lovely – great crunch with a delicious tang from the coarse ground coffee bits. 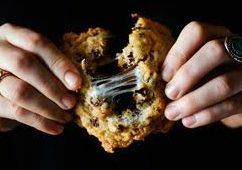 However, my three picks from the book are the pistachio cake, chocolate chocolate cookies, and the cornflake chocolate chip marshmallow cookies. 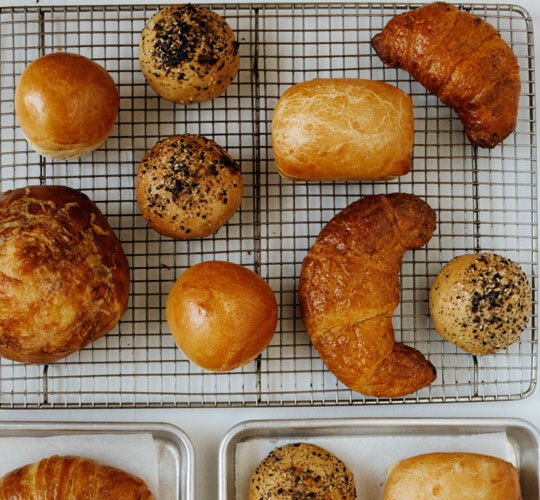 Milk Bar also bakes savoury treats, which also have their own unique twist – think unexpected fillings, savoury butters in croissants, etc. Some of these are meals in their own right. 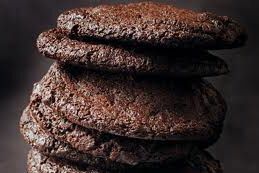 Christina is currently developing new recipes focusing on gluten-free, sugar-free and other bakery options to meet a broader range of dietary preferences. I am looking forward to her new ideas, but in the meantime, I will enjoy the inspiration that she shared at the food festival and the recipes in her wonderful cookbook. This is a lovely salad for a late lunch on a warm afternoon. It is light and fresh while still satisfying the kids’ passion for pasta. 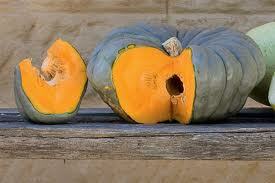 De-seed and peel pumpkin, and chop into 1.5 cm cubes. Steam until just soft. If using bacon, chop into small pieces and fry. Chop asparagus into 2 cm lenths and team until just soft. 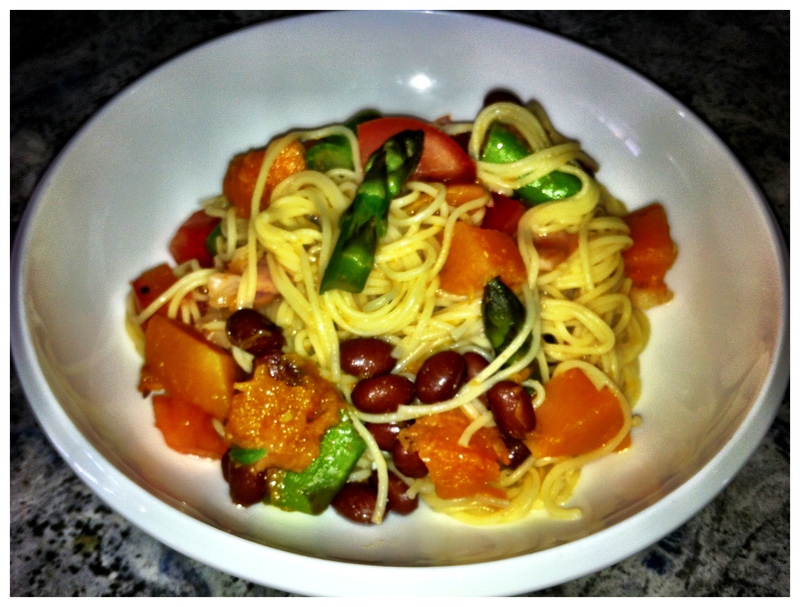 Cook vermicelli in water or vegetable stock (I prefer stock if not using bacon) until al dente. Combine all ingredients in a large bowl and serve. 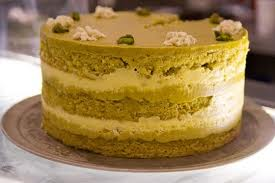 This cake recipe is from petit4chocolatier, one of my favourite blogs, and a source of regular inspiration. 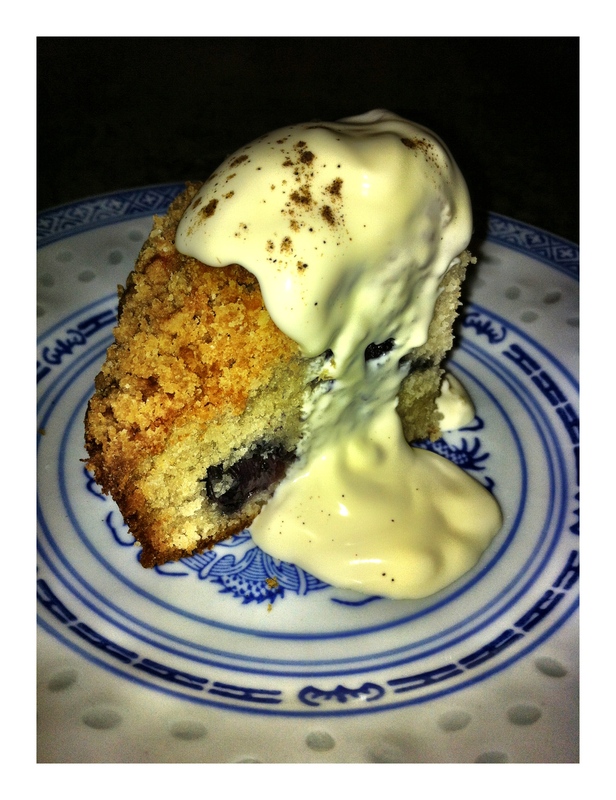 For me the blueberries make it a great springtime cake, and I love the sweet crunchy crumble topping. Combine all ingredients except butter in a bowl and mix well. Add butter and mix until well combined and mixture becomes crumbly. Set aside. Grease four 12 x 12 cm cake pans with butter. Preheat oven to 375C. In a large bowl combine flour, baking powder, nutmeg and salt. In a smaller bowl, beat sugar, eggs and oil until well mixed. Beat in milk and vanilla until mixture is smooth. Add to flour mixture and stir until well combined. 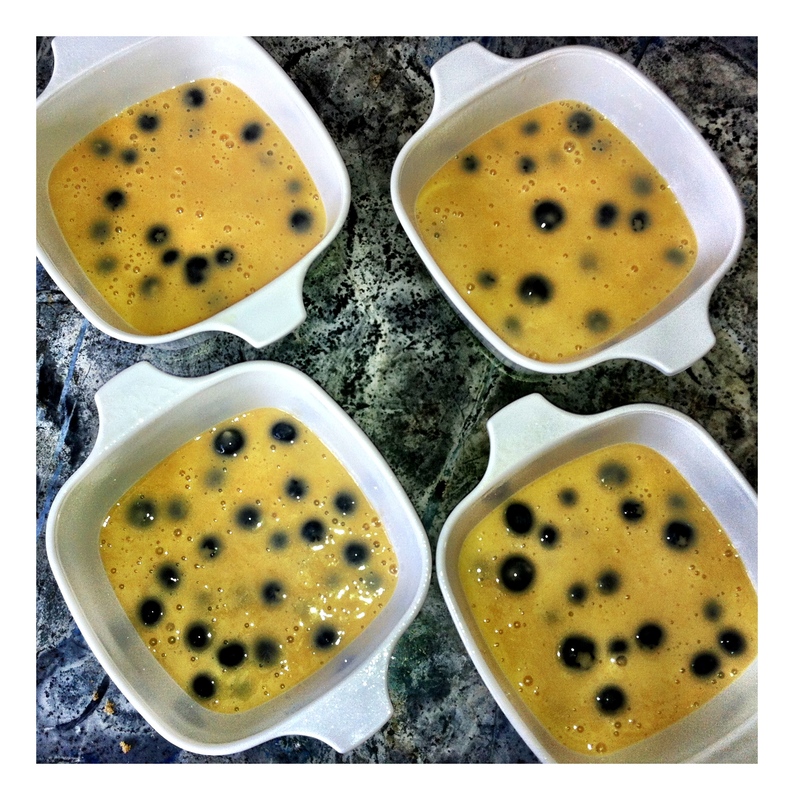 Add blueberries and mix gently. 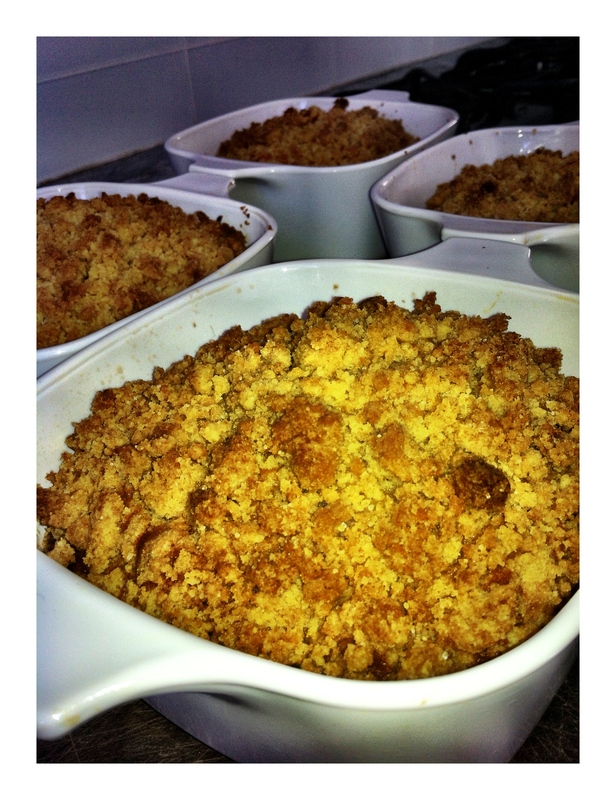 Pour mixture into prepared pans, and top with crumble mixture. Bake 35-45 minutes. Cool in pans before removing, and leave to set for at least an hour before serving.